This Broiled Rosemary Honey Salmon recipe takes less than 15 minutes to put together, with only 6 ingredients. It’s a life saver for a busy weeknight cook! 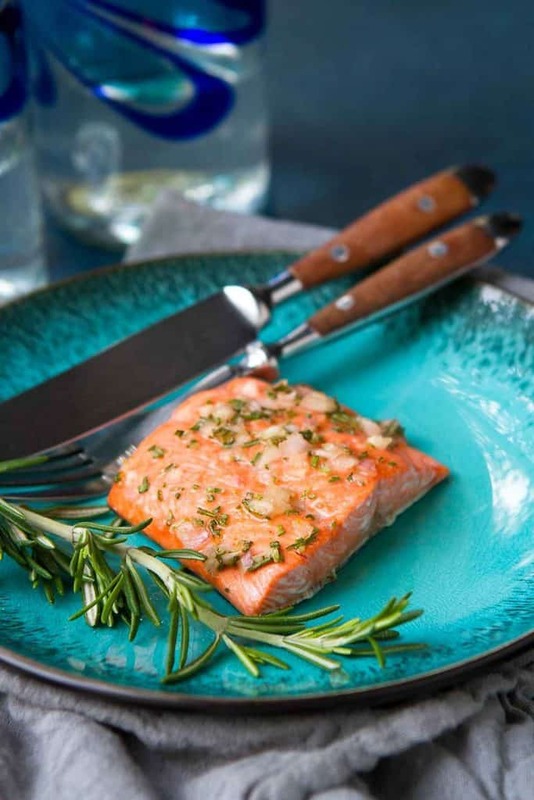 We’ve been making a version of this broiled rosemary honey salmon recipe for years. In fact, I’ve probably made this healthy salmon recipe, or a version of it, more than any other fish recipe over the years. Why? Because it’s dead simple and I always have the ingredients, or something close to them, available in my fridge and pantry. If I don’t have rosemary, I substitute fresh thyme. Out of honey? Agave will do the trick. Not a shallot to be found? A mixture of diced onions and minced garlic works just as well. While I call for skinless salmon fillets in this recipe, skinless can also be used. The salmon will easily separate from the skin once cooked. Pat the salmon dry before placing on the baking sheet. This will allow the glaze to adhere to the salmon as much as possible. Stir together all of the glaze in a small bowl, then brush or spoon it onto the salmon. 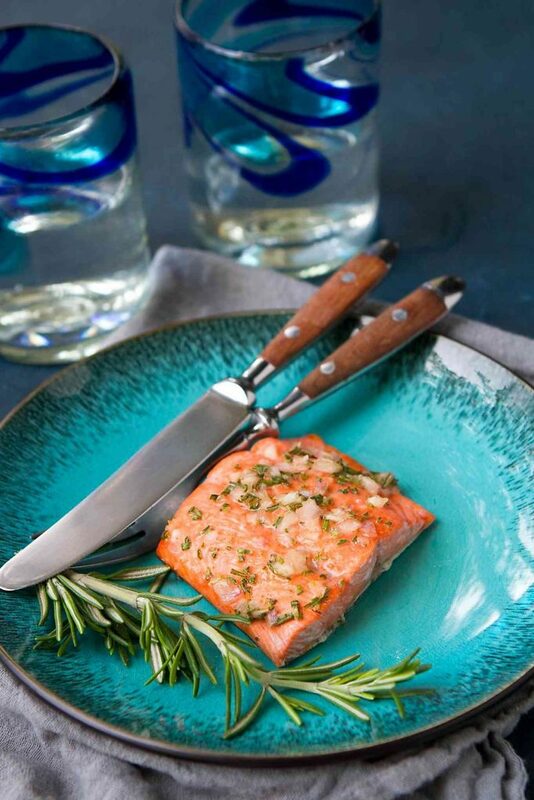 Insert a small, sharp kitchen knife into the thickest part of the salmon fillet. Hold the knife there for 10 seconds. Carefully place the flat side of the knife blade on your upper lip or inner wrist. If it’s very warm (you don’t want it to be scorching hot), the salmon is done. Preheat the broiler and place the upper rack about 6 inches from the top element. Line a baking sheet with foil and lightly coat with cooking spray. Alternatively, coat a large glass baking dish with cooking spray. 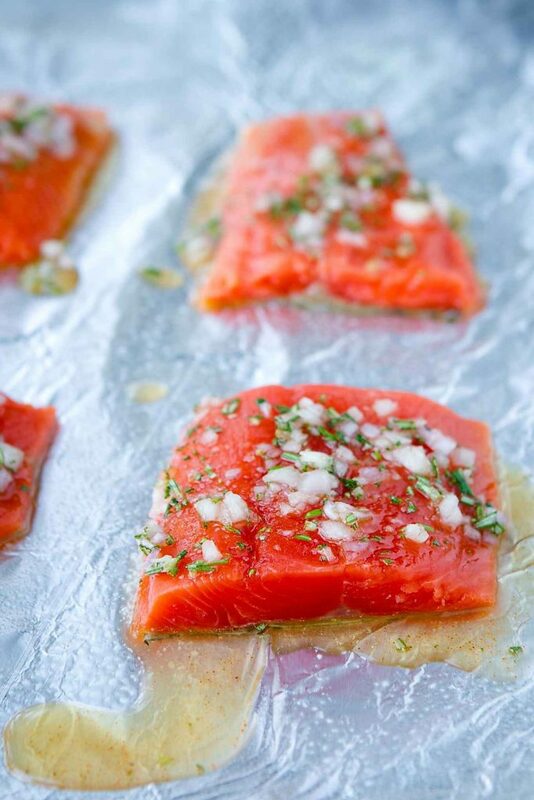 Pat dry the salmon fillets and arrange on the baking sheet. In a small bowl, stir together the honey, shallot, rosemary, white wine vinegar, salt and cayenne pepper. Brush the honey mixture over the salmon fillets. Broil until the salmon is just cooked through, 5 to 7 minutes (more time if thicker fillets). Take care not to overcook so that the fish is not dry. Serve. We made this for dinner last night and it won’t be the last time. So easy, so delicious! Another winner, Dara. Always looking for different things to do with salmon. Perfect! Oooh, so simple and delicious! Adding to our Lenten rotation!!! I love how easy this is….so fantastic for lent! This is such a lovely and healthy salmon recipe!